Hopfen: Magnum, Saphir Malz: Münchner, Karamell-, Röstmalz Darkon is inspired by traditional recipes. 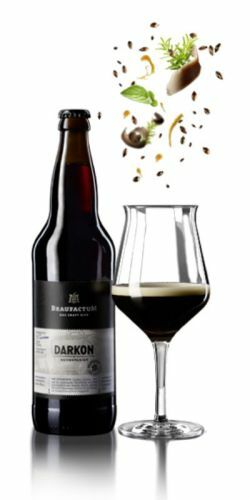 Nothing but dark malts, are used to create the characteristically mild roasted aromas of bitter chocolate and toffee. Darkon besinnt sich auf die traditionelle Herstellung der Schwarzbiere und wird ausschließlich mit dunklen Malzen gebraut. Für milde Röstaromen wird ein Teil des Malzes im Trommelröstverfahren hergestellt. UPDATED: APR 19, 2019 Bottle. Impenetrable black with large beige head. Aroma is sweet, syrup, honey. Taste is rather sweet, very malty but mild on the dark notes. Low carbonation. UPDATED: MAR 22, 2019 From the bottle. Dark brown with a creamy head. Aroma of toffee. Taste is sweet with just a touch of metallic bitterness. Medium body, soft carbonation. Drinkable and quite decent but a bit underwhelming. Bottle from Rewe, Köln. Dark brown colour, beige foam. Light roasty, notes of dark chocolate and toffee. Some sweet hints. Well balanced. Bottle, shared with Inbreak and friends. Pours deep dark brown, with a finger thick creamy, mocha head. Aroma is dark roasted malts, with dark chocolate, leather and wood. Medium body, with soft carbonation. Flavour is dark malts, with bread, dark chocolate, leather and a hint of dark liquorice.